Our childrens projects are situated in the poorest barrios on the edge of town. The first one, in the barrio of Panama, was set up in 2006 – with a donation from a La Mariposa Spanish student, we built a small room where children are given extra classes in reading and writing. It also acts a base for fun holiday projects and a lending library. Ten years ago, this school functioned with hardly any teaching resources at all – now we count on donations from La Mariposa students to provide a colourful and interesting supply of books! Asocacion Tierra employs a full time project worker – duirng school hours he offers individual chdren and small groups extra help and in the holidays runs out of school activities. A very popular small playground uses sustainable materials – straw and recyled tyres. Kids in Pananma playing on their straw and recycled tyre slide before it is even finished! One of the major concerns over the years in Panama has been the health of the children and indeed the population generally. 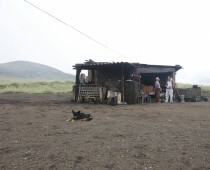 The impact of poverty – poor nutition is exacerbated by the effects of gases passing overhead from the Masaya Volcano. We welcome medical and dental brigades to help and we supplement the government provision of food so the children receive a healthy meal in the school each day. Flushing toilets are of no use as there is no running water here so La Maripos and Asocacion Tierra built latrines instead. From Panama, we have expanded into 4 more barrios – each project shares similar goals but each has its own personality! They all sprung from ideas in the community itself..in the barrio of Santiago, for example, a reading corner was well established but Save the Children withdrew their funding so they turned to us for help. It now functions in the local school. Asocacion Tierra employs project workers in each one, thus also helping to increase local employment. Karens cultural center for children is quite unique and a very poplular place for volunteering. Karen is an amazingly energetic person who ran this project by herself from her own house. As children either attend formal school in th emorning or the afternoon, they are always looking for something to do for the other half of the day and Karen offers a number of options from learning how to maintain an organic garden to manual crafts. Asocacion Tierra now pays her a small wage as well as her 2 helpers. We have also helped to renovate the pation of her house so the children have somewhere to play in the rain! The photos below show a donation arriving (from La Mariposa) whilst, in the background, the patio roof goes up! On the right, the kids are having a “Using Recycled Materials” workshop – fun and instructive. Our most recent initiative has been in the small community of Venecia. Located next to the Laguna de Masaya, this community is exceptionally poor and very isolated! The school, with only 12 children and one teacher, is starved of resources but has the advantage of a teacher who is dedicated and determined to improve things, with our help. Below you can see how delighted the kids are with a donation of school supplies. We also donate clothes, shoes (and we always check we are buying the correct sizes!) and toys thanks to donations. Before we installed a latrine with the help of a donation and volunteers, the children were defecating in the open air.